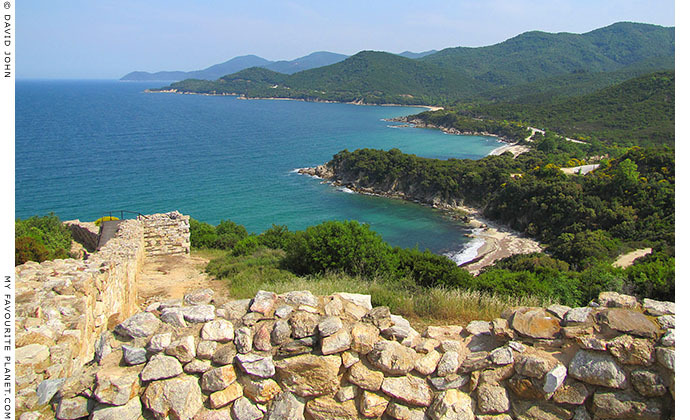 The view south from the Stageira acropolis along the northeast coast of Halkidiki. Halkidiki offers some outstandingly beautiful natural landscapes, and this is one of the finest. 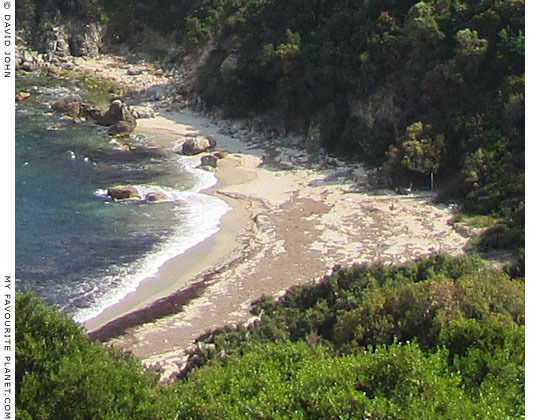 The wooded hills and small sandy bays stretch along the east coast of Halkidiki from the town of Stavros, 15 km north of here, southwards to Ierssos, site of Stageira's sister city Akanthos. 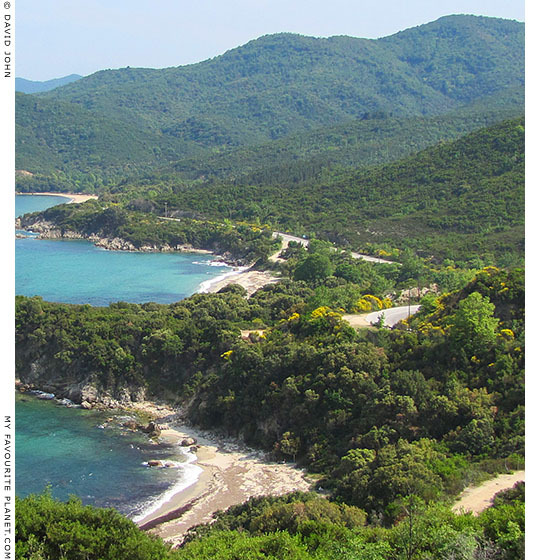 Beyond Iressos and the narrow isthmus around Nea Roda begins the mountainous eastern finger of Halkidiki and the monastic republic of Mount Athos. From a strategic point of view, Stageira was well placed to keep a look out on sea traffic in the Strymonic Gulf, and to spot the approach of potentially threatening vessels. Its own boats could find shelter in the numerous local bays, particularly its port Kapros (see Olympiada gallery pages 1-3 and 16), where Olympiada village now stands. Commercially, Stageira's location was well-suited as a port for sea trade between the mainland and the islands and cities of the northern Aegean, and beyond the Hellespont and Sea of Marmara to the Greek colonies around the Black Sea. As the Persian invaders discovered to their cost in 492 BC, the conditions around the Athos peninsula could be treacherous , and many ships' captains would have preferred to put in at a port on the eastern side of Halkidiki. Stageira's sister city Akanthos profited far more from this situation than Stageira (see History part 1), but the latter seems to have done quite well and achieved a modest degree of prosperity. on the east coast of Halkidiki, in the Strymonic Gulf. According to Herodotus, an expedition in 492 BC under Mardonius, general of the Persian king Darius I the Great, reconquered Thrace and reduced Macedon to a client kingdom. However, when Mardinius' fleet attempted to round the Athos peninsula, on its way to conquer Eretria and Athens, it was destroyed by a storm. "Crossing over from Thasos they travelled near the land as far as Acanthus, and putting out from there they tried to round Athos. But a great and irresistible north wind fell upon them as they sailed past and dealt very roughly with them, driving many of their ships upon Athos. It is said that about three hundred ships were lost, and more than twenty thousand men. Since the coasts of Athos abound in wild beasts, some men were carried off by beasts and so perished; others were dashed against the rocks; those who could not swim perished because of that, and still others by the cold." Darius' successor Xerxes learned from this catastrophe, and around 480 BC, during the second Persian invasion of Greece, he had a canal dug across the isthmus of north of the Athos penisula. 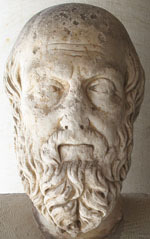 Herodotus (Greek: Ἡρόδοτος, circa 484 - circa 425 BC), "the Father of History", Greek historian born in Halicarnassus, Caria (modern day Bodrum, Turkey). Herodotus, The Histories, Book VI, chapter 44. Translated by A. D. Godley. Harvard University Press, 1920. At Perseus Digital Library.